ATN NVGOPVS7C0 PVS7-CGT Night Vision Goggles FREE SHIPPING! ATN brings you the best technology out there, keeping up with military standards and standard issue equipment for the battlefield. The PVS7-CGT Night Vision Goggles match the specs and performance of the model AN/PVS7, offering an infrared illuminating system that allows you to see in the dark. ATN's goggles feature a head strap and mounting assembly if you wish to wear it on your head or helmet, as well as a shoulder strap and neck cord should you prefer hand held usage. PVS7-CGT includes brow pads, lens tissue, a protective lens cap, and a demise shield. The goggles are waterproof and will withstand a wide range of temperature. PVS7 offers automatic on and off functioning as well as automatic brightness control and cut-off. This lightweight night vision eyepiece also comes with its own soft shell carrying case to prevent damage when not in use. ATN provides a two year limited warranty on this product. 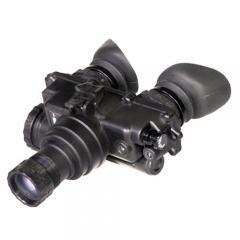 Dimensions: 148 x 80 x 155mm / 5.8" x 3.1" x 6.1"
©2002-2019 CopsPlus.com: ATN NVGOPVS7C0 PVS7-CGT Night Vision Goggles FREE SHIPPING!